Review – Wacom Cintiq Companion – Someone finally Smushed my Laptop and Sketchbook together! The Wacom Cintiq Companion is a wonderfully powerful, portable, digital, sketchbook. With all the features of a Windows tablet and the power for the most creative of minds to portray, create, enhance, and explore their creative potential. A remarkable device that allows creative people to translate their ideas seamlessly, display their concepts with professionalism, eliminates a few of the burdens of traveling, and if tweaked in active area, connect ability, and customized for particular artists use it is going to be a power house of portability. A bit of background about the Cintiq line is in order. Wacom, long a leader in the field and the best-known manufacturer in the tablet world, first introduced the Cintiq series in 2007, which combined their tablet technology with a high-quality display allowing users to work directly on their images. Over the years they have continued to refine their offerings, adding tools, sensitivity, different formats, and connectivity options. Most of these units were quite large, so they came out with a smaller model the Cintiq 13HD. Thus the Cintiq Companion line is both a refinement of existing ideas, and also represents a radical break as well since it added a complete computer system embedded in the unit. According to Wacom, “The Cintiq Companion is essentially a mobile version of the Cintiq 13HD model, combining the tablet/screen hybrid with an Android tablet (Cintiq Companion Hybrid) or a Windows 8 tablet PC (Cintiq Companion). 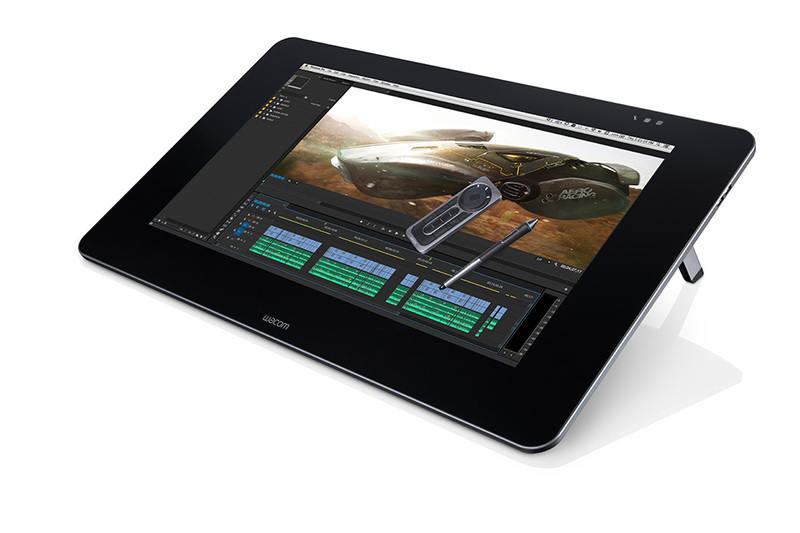 Each Cintiq Companion model features 2048 levels of pressure with multi-touch control, 1,920-by-1,080 resolution, an express key located on the left of the tablet that can be customized, excellent palm rejection, a silky matte finish, a stand that allows the user to tilt the unit to three different degrees, and weighs about 3.9 pounds. Besides the operating system, the main difference between the Android and the PC model is the storage, with the former at 16/32GB, while the latter uses a 256/512GB SSD”. There is another difference between the models is that the Android version can connect to your computer for use as a second display, whereas the Windows version doesn’t have this capability. For this review we worked with the Windows version. Ideas for creative people happen quickly, in some moments unexpectedly. We need tools that allow us to pursue those ideas with precision and confidence. I thought a sketchbook was a great tool until I utilized the Cintiq Companion. It makes the idea of using multiple pencils, various medias for color like driving a model T. The Cintiq Companion incorporated with software like Sketchbook Pro provides all the materials need to conceptualize without limitations. I cut my workflow and increase efficiently while working with authors, directors and other designers. I was trained as an animator with a photo background, while our esteemed publisher Harris Fogel specializes in digital imaging, and both of us had an ample opportunity to work with the Cintiq Companion. In the time I utilized the Cintiq Companion it went to collaborative meetings, classrooms, coffee houses, and many other places and never was a burden whether in a back pack or carrying the device in its standard case. In my opinion it helped ease my traveling circumstances without the need to take pencils, sharpeners, erasers, with a sketchbook and a laptop. I could present to clients, complete sketches, jot down notes while saving it all to the Adobe cloud for quick retrieval at home or the office. My only concern with the Cintiq Companion’s mobility was the stand. I found it somewhat cumbersome and inconsistent, and sometimes difficult to attach and detach when needed. I would have preferred sometime type of adjustable stand built in similar to the new 27Q HD model when not on the adjustable stand. I refer to the Cintiq Companion as a sketchbook because I felt its active area was a little too small for finalizing artwork to a professional level. As a seasoned Wacom Cintiq 22HD user I found the space to work limiting for those who illustrate. The problem with my assessment of the Cintiq Companion’s 11.6” x 6.5” active area may be a direct result of the comparison between working on the 22HD’s 19.5” x 11.5” active display. I found that I would transfer from the Cintiq Companion to the 22HD to finalize my work. However to make a machine like the Cintiq Companion mobile there is no way it can compare to the screen size of the 22HD. For those of us who prefer to illustrate digitally I found the touch functions to be a deterrent. Unexpected marks would plague my illustrations it became frustrating, so I had to turn off the touch controls. My drawing hand would slide across the active area and slightly touch the display as the pen was leaving the surface. Although I found this annoying I did not miss the ability to touch. After adjusting the rocker ring, radial menu and other hot key features it became an afterthought. Much like my 22HD that does not have the touch controls, I adapted the Cintiq Companion to suit my needs, which is the sign of a good piece of equipment! Not having the ability to connect the Cintiq Companion to my computer or laptop so I could use it as a tethered Cintiq display seemed like an oversight, but it is my understanding as I write this review that the newly announced Cintiq Companion 2 has the ability to connect to other devices, making the new unit a more accessible device, with a great deal more flexibility. We plan to review the Companion 2 in the near future. So stay tuned! Harris also enjoyed the responsiveness of the unit working with the full suite of Adobe apps, and found he could work on projects while doing important multi-tasking like watching the occasional TV show that would have required him to sit at his primary system, but because the Companion can be used on your lap, it is a liberating experience, powerful, portable, and reliable. Both of us agree; the Wacom Cintiq Companion comes highly recommended for the creative professional.